Download FISCAL FACT No. 491: Summary of the Latest Federal Income Tax Data, 2015 Update (PDF)Download Summary of the Latest Federal Income Tax Data, 2015 Update (EXCEL)The Internal Revenue Service has recently released new data on individual income taxes for calendar year 2013, showing the number of taxpayers, adjusted gross income, and income tax shares by income percentiles. The data demonstrates that the U.S. individual income tax continues to be progressive, borne mainly by the highest income earners. In 2013, 138.3 million taxpayers reported earning $9.03 trillion in adjusted gross income and paid $1.23 trillion in income taxes. Every income group besides the top 1 percent of taxpayers reported higher income in 2013 than the previous year. 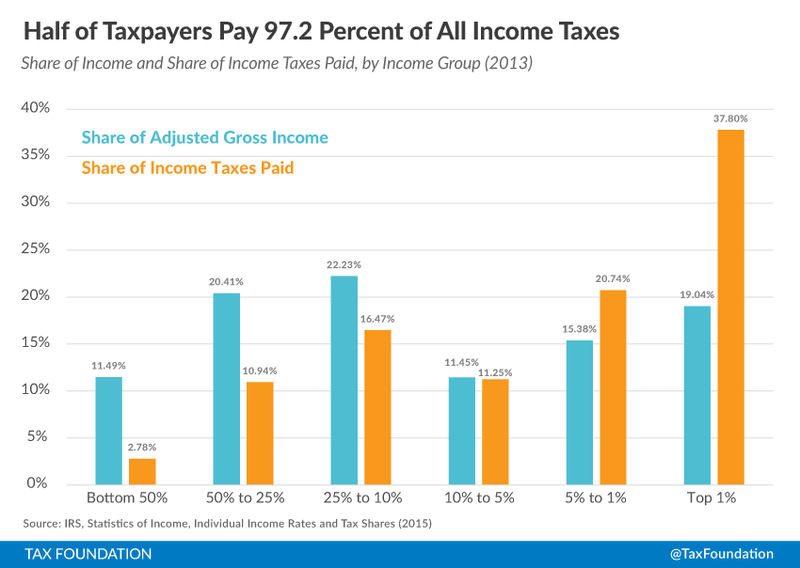 All income groups paid higher taxes in 2013 than the previous year. The share of income earned by the top 1 percent of taxpayers fell to 19.0 percent in 2013. Their share of federal income taxes fell slightly to 37.8 percent. The top 1 percent of taxpayers paid a higher effective income tax rate than any other group, at 27.1 percent, which is over 8 times higher than taxpayers in the bottom 50 percent (3.3 percent). Taxpayers reported $9.03 trillion in adjusted gross income (AGI) on 138.3 million tax returns in 2013. While the U.S. economy grew in 2013, total AGI fell by $8 billion from 2012 levels. Furthermore, there were 2.2 million more returns filed in 2013 than 2012, meaning that average AGI fell by $1,131 per return. The most likely explanation behind lower AGI in 2013 is unusually high capital gains realizations in 2012. Because the top tax rate on long-term capital gains and qualified dividends was set to rise from 15 percent to 23.8 percent in 2013, many high-income Americans realized their capital gains in 2012, to take advantage of low tax rates. As capital gains realizations fell to normal levels in 2013, overall AGI decreased. Accordingly, only the top 1 percent of taxpayers saw a decrease in income in 2013; all other groups saw their income increase. Despite the decrease in overall income reported, taxes paid increased by $46 billion to $1.232 trillion in 2013. Taxes paid increased for all income groups. The share of income earned by the top 1 percent fell to 19.04 percent of total AGI, down from 21.86 percent in 2012. The share of the income tax burden for the top 1 percent also fell slightly, from 38.09 percent in 2012 to 37.80 percent in 2013. Does not include dependent filers. In 2013, the bottom 50 percent of taxpayers (those with AGIs below $36,841) earned 11.49 percent of total AGI. This group of taxpayers paid approximately $34 billion in taxes, or 2.78 percent of all income taxes in 2013. In contrast, the top 1 percent of all taxpayers (taxpayers with AGIs of $428,713 and above), earned 19.04 percent of all AGI in 2013, but paid 37.80 percent of all federal income taxes. In 2013, the top 1 percent of taxpayers accounted for more income taxes paid than the bottom 90 percent combined. The top 1 percent of taxpayers paid $465 billion, or 37.80 percent of all income taxes, while the bottom 90 percent paid $372 billion, or 30.20 percent of all income taxes. 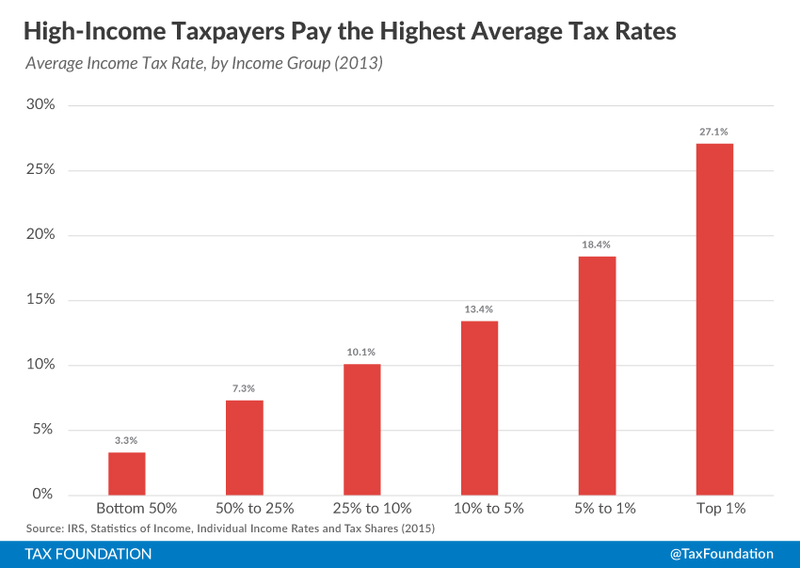 High-Income Taxpayers Pay the Highest Average Tax Rates The 2013 IRS data shows that taxpayers with higher incomes pay much higher average income tax rates than lower-income taxpayers. The bottom 50 percent of taxpayers (taxpayers with AGIs below $36,841) faced an average income tax rate of 3.3 percent. Other taxpayers face much higher rates: for example, taxpayers with AGIs between the 10th and 5th percentile ($127,695 and $179,760) pay an average effective rate of 13.4 percent – four times the rate paid by those in the bottom 50 percent. The top 1 percent of taxpayers (AGI of $428,713 and above) paid the highest effective income tax rate at 27.1 percent, 8.19 times the rate faced by the bottom 50 percent of taxpayers. Taxpayers at the very top of the income distribution, the top 0.1 percent (with AGIs over $1.86 million), paid an even higher average tax rate, of 27.9 percent. The average tax rate of the top 1 percent of taxpayers rose significantly in 2013, from 21.9 percent in 2012 to 27.1 percent in 2013. This increase in the average tax rate of the 1 percent was largely due to several changes to the federal tax code, imposed at the end of 2012 as part of the “fiscal cliff” tax deal: a new 39.6 percent income tax bracket, a higher top rate on capital gains and dividends, and the reintroduction of the Pease limitation on itemized deductions. The Tax Reform Act of 1986 changed the definition of AGI, so data above and below this line are not strictly comparable. The IRS changed methodology, so data above and below this line are not strictly comparable. To access this data on GitHub, click here. (1) For data prior to 2001, all tax returns that have a positive AGI are included, even those that do not have a positive income tax liability. For data from 2001 forward, returns with negative AGI are also included, but dependent returns are excluded. (2) Income tax after credits (the measure of “income taxes paid” above) does not account for the refundable portion of EITC. If it were included, the tax share of the top income groups would be higher. The refundable portion is classified as a spending program by the Office of Management and Budget and therefore is not included by the IRS in these figures. (3) The only tax analyzed here is the federal individual income tax, which is responsible for about 25 percent of the nation’s taxes paid (at all levels of government). 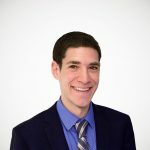 Federal income taxes are much more progressive than payroll taxes, which are responsible for about 20 percent of all taxes paid (at all levels of government), and are more progressive than most state and local taxes. (4) AGI is a fairly narrow income concept and does not include income items like government transfers (except for the portion of Social Security benefits that is taxed), the value of employer-provided health insurance, underreported or unreported income (most notably that of sole proprietors), income derived from municipal bond interest, net imputed rental income, and others. (5) The unit of analysis here is that of the tax return. In the figures prior to 2001, some dependent returns are included. Under other units of analysis (like the Treasury Department’s Family Economic Unit), these returns would likely be paired with parents’ returns. (6) These figures represent the legal incidence of the income tax. Most distributional tables (such as those from CBO, Tax Policy Center, Citizens for Tax Justice, the Treasury Department, and JCT) assume that the entire economic incidence of personal income taxes falls on the income earner. Individual Income Tax Rates and Tax Shares, Internal Revenue Service Statistics of Income, http://www.irs.gov/uac/SOI-Tax-Stats-Individual-Income-Tax-Rates-and-Tax-Shares.